Inside a nondescript building in an industrial corner of Hyattsville, Maryland, Metro has amassed the nerve center for one of the most sophisticated closed-circuit camera networks in the world. And the transit system has a message for you: They are watching. "Being transparent with our riders -- if you are in any public space within the Metro system, there's a good chance you are going to be caught on camera somewhere," Metro Chief of Police Ronald Pavlik said. Facing recent reports about a spike in crime and dealing with high-profile episodes of attacks on the Metrorail system, leaders opened the doors to the new facility, which displays a dizzying array of electronic eyes. All 91 rail stations are visible at any time, in real time. Some individual stations boast as many as 100 cameras. Metro buildings are on display. Parking lots are being monitored, as are elevators. Cameras that watch every part of Metrorail's system. "It's also a message for the bad guys, because guess what? We watch you, we got you and we are going to get you if you do anything on our system," Metro General Manager Paul Wiedefeld said. Metro leaders talked about an episode Jan. 28 in which a group of teens traded punches with a man at the Gallery Place station. This camera network gives them the flexibility to respond to those kinds of incidents quickly, Metro said. "That crime occurred within about 20 seconds from the time that they got on to the time that they got off." Pavlik said. "We know what train they are on. We have officers up the line prepared to stop that train. The technology speaks for itself." In that case, six teens were identified and pulled off a train as it entered the Woodley Park station farther along the Red Line. Buses have plenty of cameras as well, but officers in the field are connecting wirelessly to the bus to monitor those cameras. "You can clearly see, you are going to get caught on camera somewhere," Pavlik said. 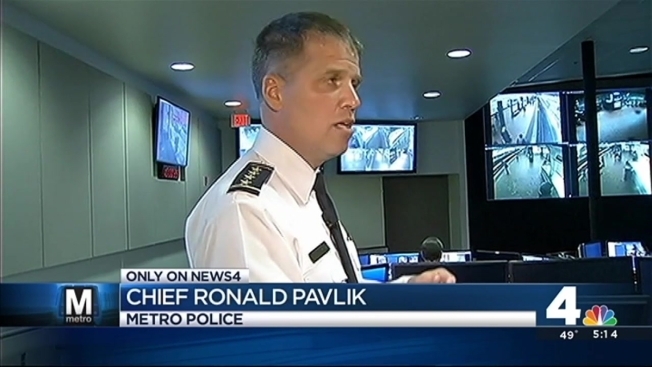 Metro Chief of Police Ronald Pavlik. Even if Metro doesn't catch an incident happening in real time, the cameras are constantly recording and can be accessed to search a specific time and date. But cameras can only do so much. Metro admits it would love to have more transit police officers available and is considering a new strategy to change the uniforms for transit police to make them more visible on trains, in stations and on buses. "I'm sure any police chief in the United States would say that they'd love to have more officers," Pavlik said. As far as banning individuals who commit crimes in the system from riding, "stay away" orders have been issued in the past for riders, Metro said. However, those orders have come from a judge. In the recent case of the teenagers involved in the Gallery Place fight, their right to ride the system will not be revoked.